Articles about "Sony Ericsson XPERIA X1 Review" in this website is free. Read our reviews for "Sony Ericsson XPERIA X1 Review", gadget price, specs, features and find more latest Electronic Gadget Reviews and News. Sony Ericsson XPERIA X1 review - Sony Ericsson XPERIA X1, With all of its brushed metal and polished black accents, the Sony Ericsson Xperia X1 achieves a sort of executive look. Sony Ericsson XPERIA X1 lets you enjoy the convergence of communication and entertainment. The Sony Ericsson Xperia X1 comes with Google Maps preloaded, and a trial version of the Wayfinder Navigation app comes included on the install disk in the box. With Google Maps, the phone was very quick to find our location, perhaps thanks to the QuickGPS software that preloads some of the satellite information onto your phone in advance. 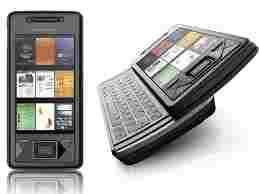 For the most part, the Sony Ericsson Xperia X1 uses the Windows Mobile 6.1 Professional user interface. However, the traditional Today Screen has been replaced by Xperia Panels, or more specifically a Panel Manager. The Panel Manager handles two types of panels: Native panels and Web panels. It is worth noting that the external volume rocker is well placed and much appreciated, as is the marvelous 3.5-millimeter headphone jack. Also, we love how tightly integrated the 3.2-megapixel camera (and flash) is with the body, but we're not so hot on where the lens is. Time after time, we found ourselves having to move our finger from how it naturally fell when gearing up to depress the shutter button in order to snap a photo. Maybe our gorilla hands are just clumsy like that, but it seems to us the lens is placed precisely where your middle finger on your left hand will always reside when holding the camera for a shot. As for the camera quality? We'd say it's pretty darn great for a cellphone, but then again, the inbuilt camera tends to be one of Sony Ericsson's strong suits. Have a look at the sample shots below to see what it's capable of. The multimedia interface on the Sony Ericsson Xperia X1 steals the show. It looks just like the cross-navigation bar we've seen on other Sony Ericsson devices recently, like the Sony Ericsson W760, except with a little more visual panache on this phone. Honestly, it looked so good, responded so well to touch and was so organized that we wished this were the entire phone interface. The music player on the phone is also a serious improvement over Windows Media Player, though if you dig too deep through the interface you'll get caught in the older player's snare. We still prefer the Walkman music player, which is similar but has better playlist creation tools and some cool interface effects. Why Sony refuses to enlist their best music player on their best smartphone is beyond our comprehension. So, now that you've combed through the ups and downs of the hardware, we're logically ready to tackle software. By and large, what you've got here is tried and true Windows Mobile 6.1. In fairness, the operating system is beginning to show its age, and unlike the Touch Diamond, there isn't much here to mask it. Those familiar with WinMo 6.1 will feel immediately at home on the XPERIA X1. Everything is where you'd expect, and everything functions just like you're used to. Outside of the unique Panels interface, you won't find anything too out of the ordinary here. One would think the 528MHz Qualcomm MSM7200 processor coupled with 256MB of RAM could chew through this OS with ease, but in our testing, we found that not to be the case in too many instances. On an annoyingly frequent basis, we found the "OK" button and hard "Exit" trigger to do absolutely nothing for 5, 10, even 20 seconds. The Sony Ericsson Xperia X1 uses the Opera browser, and in fact it looks almost exactly like the same app on the HTC Touch Pro. Strangely, the phone also comes with Internet Explorer, a far inferior browser, and all of the user manuals and default settings point to IE instead of Opera. But avoid the former and enjoy the latter, because Opera is a great browser, and it chewed through our image-heavy homepage with no trouble. We'd like to see better navigation controls, perhaps a zoom button or two and a mini map would be nice for faster browsing. We tried the Xperia X1's browser head-to-head against the Apple iPhone 3G, on both AT&T's network and our home Wi-Fi network, and in all cases the iPhone's Safari browser finished loading the page at least five seconds before the X1 could finish. The camera on the Sony Ericsson Xperia X1 was okay, and the images it produced could be clean and clear, or blurry and unusable. At first glance the camera's feature set seems exceedingly impressive. Besides the 3.2-megapixel sensor, the camera has auto focus with a 2-stage shutter button, a touch focus option that lets you tap on the portion of the picture you want in focus, and plenty of other camera tweaks. Unfortunately, we found this camera's focus to be way off, whether we were using the full auto, the touch focus or even the macro mode. Given that the X1 managed to secure a 3.5-millimeter headphone jack (very much unlike the G1, sadly), we reckon a swath of potential buyers are probably interested in the multimedia capabilities. Thanks to SE's panel that caters specifically to that, we were able to browse, playback and skip around within our tunes right from the home screen. Our experience was generally positive, with the audio being crisp, clear and plenty audible. In the end, a phone's merits on paper are only truly laudable if the end product is easy and painless to use. To that end, we'd like to take this opportunity to focus on some of the handset's more critical functions, namely calling and navigating. In a fringe area of AT&T coverage, we compared the X1's reception with that of the iPhone 3G, and unfortunately, our findings weren't all that copacetic for Sony Ericsson's offering. In areas where we could eke out a call on EDGE with two bars on the iPhone 3G (with no crackling, drops, etc. ), we couldn't with the X1. In fact, we found it constantly hopping in and out of 3G, EDGE and GPRS (yes, seriously) as it attempted in vain to secure a solid signal. Worse still, a number of calls made with four bars of 3G echoed uncontrollably to the point where we were forced to hang up, move to a different area, and try the call again. The Sony Ericsson Xperia X1 comes with Google Maps preloaded, and a trial version of the Wayfinder Navigation app comes included on the install disk in the box. With Google Maps, the phone was very quick to find our location, perhaps thanks to the QuickGPS software that preloads some of the satellite information onto your phone in advance. Here again, with the GPS navigation services, Sony Ericsson has missed an opportunity for a Panel. We would like to see some interesting location-based services with this phone, especially since the GPS is performing so well. As an Internet Sharing device, the Sony Ericsson Xperia X1 was one of the fastest tethered modems we've used. The phone tops out at 7.2Mbps HSDPA, speeds we don't even have available in the U.S. On AT&T's 3G network in suburban New Jersey, we regularly clocked download speeds in excess of 1.8Mbps, which is the fastest we've seen on a smartphone so far. Add to this the phone's Wi-Fi connection, and you might not even need to take your notebook out of your bag. With a standard miniUSB jack, the phone can easily charge with an available cable on the road. We couldn't ask for more in a travel companion. Sony Ericsson XPERIA X1 review.